A poetry pamphlet containing this poem by Frances Grant, who also provided the cover illustration. The poem describes the use of the Draconarius in a Roman battle against the Britons. The Draconarius is a decorated Dragon's head mounted on a long pole, carried into battle by a soldier on foot or on horseback. Inside the head are reeds, which, when turned into the wind, whistle or scream. 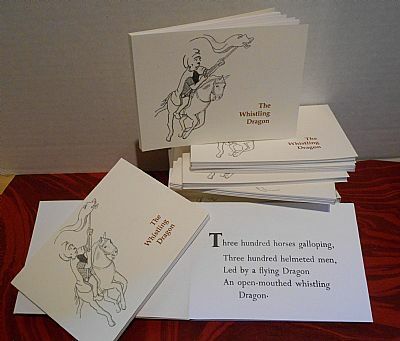 The pamphlet is letterpress printed in a limited edition of only twenty copies. £9 including postage in the U.K.